An essential component of CCF’s working ethic is to engage with other organizations to accomplish common goals. CCF has forged stimulating and productive relationships with the Carlisle Conservation Commission, Carlisle Trails Committee, New England Wild Flower Society, Sudbury Valley Trustees, Mass Audubon, SuAsCo CISMA, Acton Land Stewardship Committee, Audubon Ecological Extension Services, The Friends of Gleason Public Library, Carlisle Public Schools, Grassroots Wildlife Conservation, The Trustees of Reservations, Menotomy Bird Club, and Carlisle Boy Scouts. The Elliott River Preserve, 9 acres located on the Concord River adjacent to Great Meadows NWR, was permanently protected in 2013 thanks to the generosity of the Elliott family, the citizens of Carlisle, and the combined fundraising efforts of many groups including CCF. The property is managed by the Sudbury Valley Trustees (SVT) with a CR held by ConsCom. The property was formally dedicated early on October 17 this year at a “Sunrise Celebration” ribbon cutting ceremony hosted by SVT and including the dedication of a bench overlooking the river (above) with a plaque honoring the Elliotts (inset). This past year, CCF sponsored or co-sponsored events on tracking animals in the snow, stone walls and their history, caterpillars, dragonflies, birds, vernal pools, wildflowers, and mushrooms. Programs continue this winter with more animal tracking, a lichen program, a repeat of the popular stone wall talk, and more. Our programs with the Carlisle schools continue to be popular with both students and teachers. In May, CCF members, in conjunction with Mass Audubon, held nature outings on the Conant Land for kindergartners and, for the first time, middle school students. This year, we will continue the middle school program and our support for Bryan Windmiller’s multi-year propagation program for the endangered Blanding’s turtle with the elementary school. In April, Kevin Gardner used a pry bar to point out a distinguishing feature of a stone wall on the Towle Land (above left). Later that month, Bryan Windmiller led a vernal pool walk on the Conant Land (above middle). Steve Spang’s wildflower walk in July was videotaped for broadcast on CCTV (right). CCF owns or co-owns 23 properties and holds 15 Conservation Restrictions (CRs). These properties require regular oversight and maintenance. We have engaged Audubon Ecological Extension Services to start the process of developing baseline assessments of all our properties, beginning with Ben’s Woods, Benfield Hill and CCF’s Greenough property. Baseline assessments include documentation of boundaries, delineation of natural communities, listing of wildlife species, and development of maintenance plans. We continue our battle against invasive plants that threaten to overrun our land, displace native species, and harm native wildlife habitat. We are working with New England Wild Flower Society on Ben’s Woods and Spencer Brook Reservation to limit these pests, open up vistas, reclaim meadows, and free trees from bittersweet’s stranglehold. Land stewardship includes periodic walking of our properties and CRs to check for encroachments. Another task is confirming property boundaries. CCF members check surveyor’s stakes that may mark either holes drilled into stone walls (above left) or newly placed granite markers to memorialize bounds, and then record the GIS coordinates (above middle). Over 50 yearly growth rings were counted in the specimen of bittersweet (above right) collected by Steve Tobin during the April clearing of Ben's Woods, compared with typical twigs of this invasive found in Carlisle gardens. John Lee, both of whom are well-known in the Carlisle community for their many years of dedicated service to the Town. a means for individuals to support CCF beyond their important contributions to the Annual Appeal. 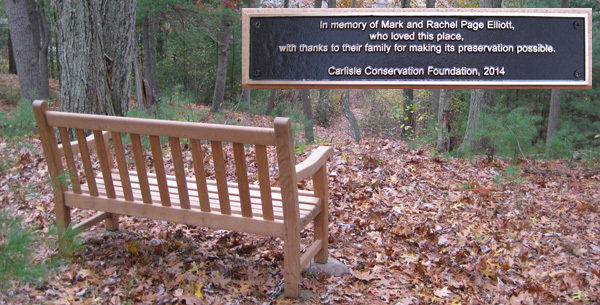 The Society honors those who choose to name CCF in their estate plans to make a deferred but lasting impact on land preservation in Carlisle.